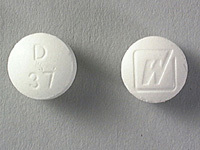 Demerol is the trade name for the drug Pethidine (INN) or meperidine (USAN). It is a fast-acting opioid analgesic drug. Demerol is used to deal with moderate to severe pain, and is delivered as hydrochloride tablets, as a syrup, or by intramuscular or intravenous injection. Because Demerol has the potential to be both physically and psychologically habituating, it is important that it be used in only the doses prescribed, and that withdrawal from the drug be supervised by a physician to ensure there are no adverse reactions. Demerol has effects similar to morphine, but has very little effect on cough or diarrhea. Demerol is more lipid-soluble than morphine resulting in a faster onset of action. It duration of clinical effect is 120-150 minutes. In addition, it has a slight antimuscarinic effect. What is the most important information I should know about Demerol? Demerol may be habit forming. Physical and/or psychological dependence can occur, and withdrawal effects are possible if the medication is stopped suddenly after prolonged or high-dose treatment. Do not stop taking Demerol suddenly without first talking to your doctor if you have been taking it continuously for more than 5 to 7 days. Your doctor may want to gradually reduce the dose. Demerol may increase the effects of other drugs that cause drowsiness, including other pain relievers, alcohol, antihistamines, sedatives (used to treat insomnia), antidepressants, anxiety medicines, and muscle relaxants. Tell your doctor about all medicines that you are taking, and do not take any medicine without first talking to your doctor. Demerol may cause constipation. Drink plenty of water (six to eight full glasses a day) to lessen this side effect. Increasing the amount of fiber in the diet can also help to alleviate constipation. Never take more Demerol than is prescribed. If the pain is not being adequately treated, talk to your doctor. Demerol interacts with a number of other medications, including muscle relaxants, antidepressants, benzodiazepines, and alcohol. It is especially dangerous to use if the patient is using monoamine oxidase inhibitor (MAOI) type antidepressants. Such patients may suffer agitation, delerium, headache, convulsions, hyperthermia. It is thought to be caused by an increase in cerebral serotonin concentrations. Demerol is also relatively contraindicated for use when a patient is suffering from gallbladder, liver, or kidney disease, has a history of seizures or epilepsy, has an enlarged prostate or urinary retention problems, or suffers from hyperthyroidism, asthma, or Addison's disease. Users of Demerol may experience serious adverse effects. These include asthma, swelling of the mucous membranes of the nose and throat, swelling of the lips, tongue, or face, seizures, cold and clammy skin, or dizziness and possible unconsciousness. The presence of any of these side effects is an indicator to stop using Demerol immediately and seek immediate medical attention. • Symptoms of a Demerol overdose include slow breathing, seizures, dizziness, weakness, loss of consciousness, coma, confusion, tiredness, cold and clammy skin, and small pupils.